I've been meaning to start this blog for quite some time now, just as a place to clear my thoughts and get some ideas out about the game I love. I've been told I can talk one's ears off when it comes to hockey, so what better for me than to start writing a blog about it. A little about me: I've been watching the New Jersey Devils play since the early 2000's, when I was very young. It's been a decade of ups and downs, with the perennial hope that this every season is ours. The years go on, the hope goes on, the game goes on. I'll start with the defensemen, because the class of free agents this offseason is relatively weak. In fact, the most important free agent defenseman for the Devils to sign, comes from within their own organization. The most important defensive free agent is pending UFA Mark Fayne, who the Devils hope to re-sign before he hits the open market, July 1st. Let's take a quick look at his stat line over the past season. With 72 games played, Fayne had 4 goals and 7 assists for 11 total points and a +/- of -5. At first glance, those are not astounding numbers, however that is not Fayne's responsibility on the team. He is a shutdown defenseman and compliments his defensive partner, Andy Greene. Why I'd like Fayne back in NJ: He's a puck-moving defenseman with tremendous possession stats. According to ExtraSkater.com, Fayne had the 4th highest Corsi % on the team this season. At 55.3%, Fayne's Corsi is higher than the team's average of 54.6%. It's not like Fayne had an easy competition, either. He was on the top line pairing with Greene, and had significant Quality of Competition %. 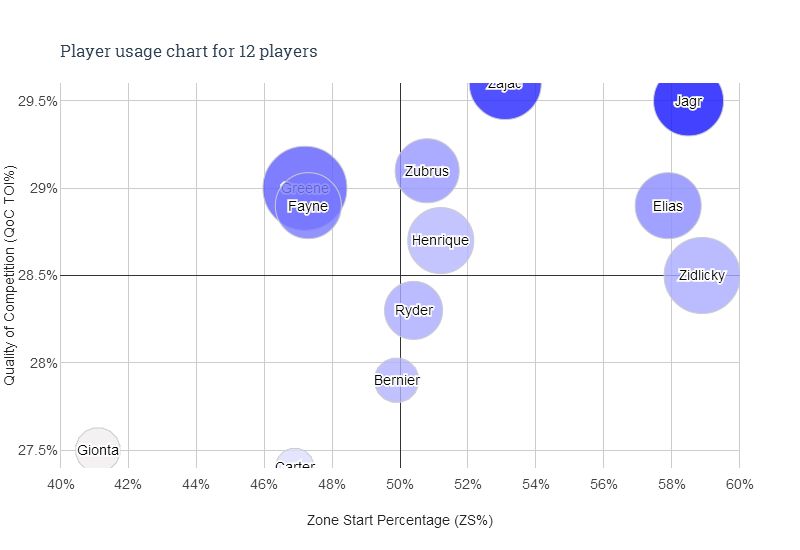 Like any top defensive pairing, Fayne and Greene had the highest zone start percentage, as well as the highest Quality of Competition TOI percent of all the defensemen on the team, as seen in the graph below. Comparatively to other UFA defensemen, Fayne has the 3rd highest Corsi %, behind NYR Anton Stralman in first and LA Willie Mitchell. Right behind Fayne is PIT Matt Niskanen, followed by SAN (now NYI) Dan Boyle, so Fayne is in good company. The most important thing to note about the chart above is Fayne's high corsi stats despite his low offensive zone start percentage.